One of my favorite parts of my 2014 trip to the TCM Film Festival was my visit to the Larry Edmunds Bookshop on Hollywood Blvd. I picked up a few books on both trips (this time my favorite find was Francois Truffaut: Interviews, which I'm just about finished with. I highly recommend it!) but what I was REALLY excited about was their extensive collection of 8" x 10" stills and promotional photos. I came prepared with a short list of stars and films that I wanted to look up, and I walked away with 13 photos. My absolute favorite is this picture of Monica Vitti. I think this photo really captures both facets of her onscreen persona -- her inimitable coolness, the chic and distant quality that's present in her Antonioni films, as well as her coy playfulness that's more evident in her comedies. Part of me wants to hang this up in my dressing/makeup area so I can be inspired by her when I get ready, and part of me feels like this is just so unattainable that it needs to go in my office instead, so I won't be crushed by my inferiority complex each morning. 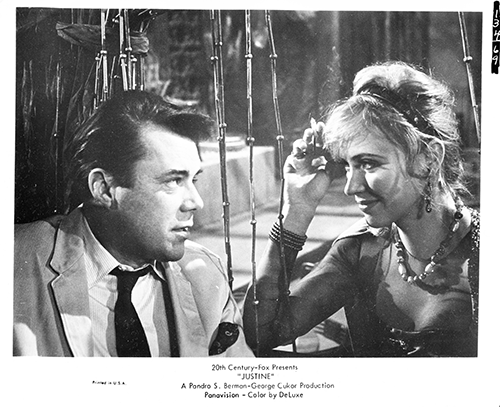 Dirk Bogarde and Anna Karina in one photo -- sold! Confession: I actually still haven't seen Justine. It's craziness since it stars two of my all-time favorite people, but I've been sort of reserving it for my future self. Does anyone else do this? I know it might sound insane. Even though I love re-watching my favorites, there's really nothing like seeing a movie for the first time and I don't want to run out of fresh films too early in the game. Young and Innocent!!! I did NOT expect them to have a photo from this movie, it's always so hard to find any kind of memorabilia. It's my favorite Hitchcock film, and one of my top-5 favorite movies of all time. I would have bought pretty much anything they had on this film, but what a fantastic bonus that the photo is so great! I love that Derrick De Marney is technically in the picture, too. "Lighthouses, John. Lighthouses in a foggy world." 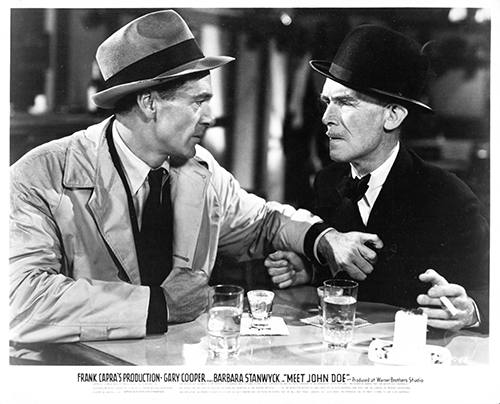 Casey and I were discussing our favorite James Gleason roles the day beforehand, and I said my favorite movie of his was Meet John Doe, and my favorite SCENE was the "lighthouses in a foggy world" scene. Then the next day I managed to snag a still of that exact scene! So fantastic! 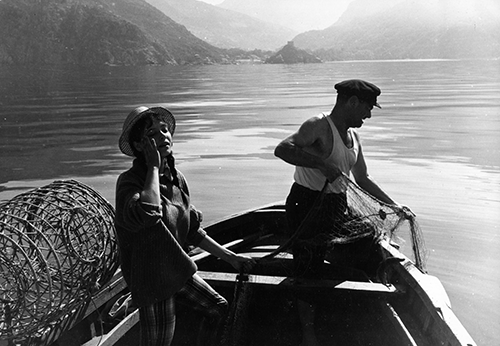 I love posed stills (like the Monica Vitti one) but I especially love stills that capture an exact movie scene that I love. When you have it hanging on your wall it's almost like it brings the movie to life whenever you glance at the picture. I need to stop writing such long captions for these or this post is going to be WAY too long. 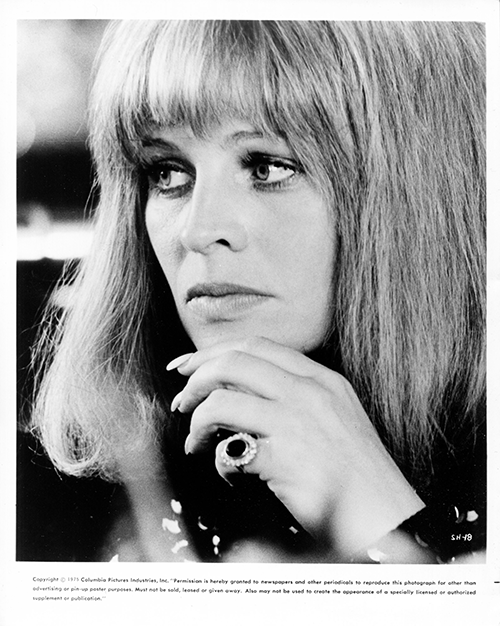 Here's Julie Christie from Shampoo. Not my favorite of her films, but what a photo! Alain! 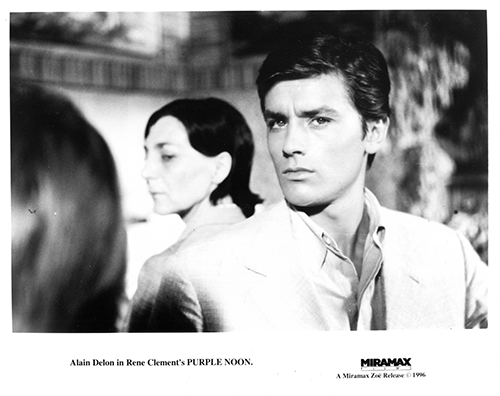 Purple Noon! Their Alain Delon folder was EMPTY (understandable, I mean, look at his face) but they did have this fantastic still from Purple Noon. And, like Meet John Doe, I love this scene from the film so it's a nice reminder of the movie! 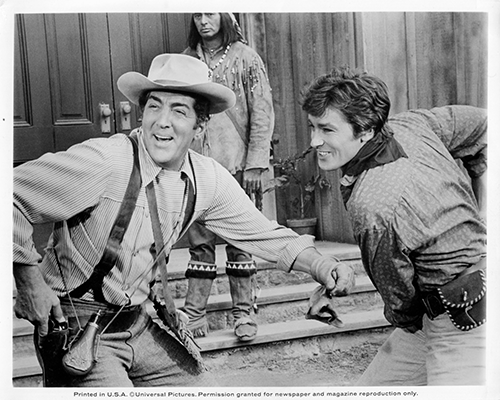 Why yes, that is Dean Martin and Alain Delon in a western. And yes, that is Joey Bishop in the background. Don't even ask. 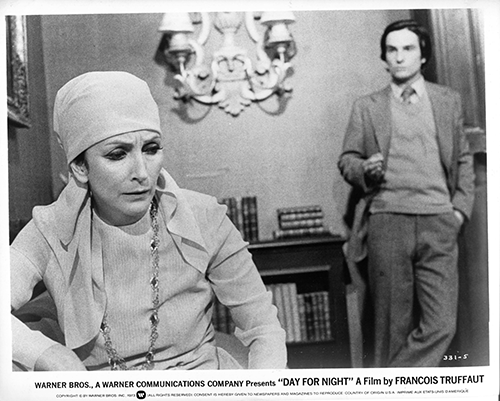 Ideally I'd love a shot of Truffaut playing the director in Day For Night (especially since Jean-Pierre Leaud is my least favorite of all the New Wave regulars) but I love the movie so much that I couldn't pass this up! This movie was so bad I have no idea why I continue to buy photos from it (I already have two sets of stills and then I just added this to the collection) but I can't help myself. In theory the idea of a 1960's movie about the middle ages starring Monica Vitti still fascinates me, despite the fact that I've seen the movie and know for a fact that it's horrible. One more Alain Delon photo! And um... I haven't watched this movie yet, either! OOPS! It's another one that I'm saving. I think I only have two Alain Delon movies left that seem legitimately good (this one, Is Paris Burning?, and The Leopard) Most of the other ones I have left are the obscure 70's or 80's crime flicks that never had proper home video releases. Okay -- the cast: Alain Delon, Jean-Paul Belmondo, Kirk Douglas, Leslie Caron, Orson Welles (!!! 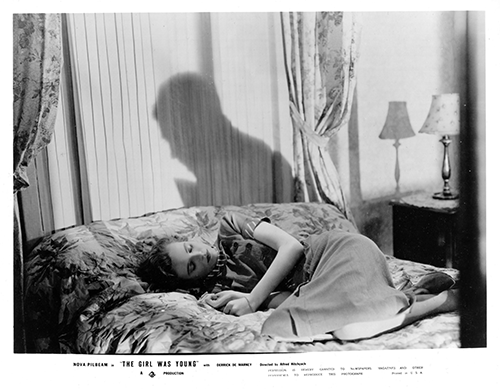 ), Charles Boyer, Anthony Perkins, Simone Signoret, Glenn Ford, Romy Schneider, Jean-Louis Trintignant, and Robert Stack. 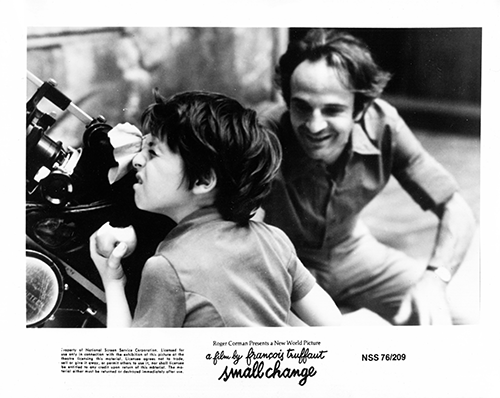 The crew: Screenplay by Francis Ford Coppola and Gore Vidal. 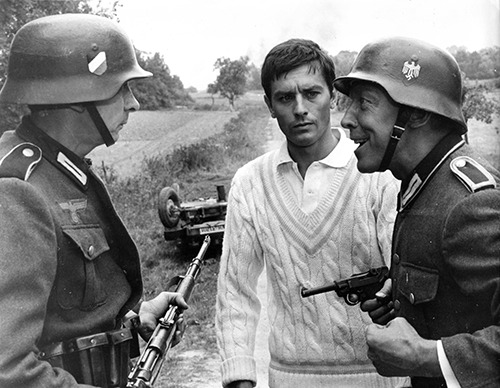 Directed by Rene Clement. Score by Maurice Jarre. Last but certainly not least, is this photo of Anna Karina. Isn't it just beautiful? And that wraps up my TCMFF souvenirs! I also bought a couple things from the TCM Gift Shop (a lapel pin and a vinyl tote bag) and a Hollywood snow globe (I was embarrassingly excited to discover that you can pack snow globes in your checked baggage.) but the photos were definitely my favorite. They're such unique souvenirs, and I love that they simultaneously remind me of my favorite movies AND my trip to the TCM Film Festival. I saw Is Paris Burning? once, like twenty years ago, and was bored stiff. But I was like 15, and expecting it to be a "typical" WWII movie, so who knows? I might really dig it now. It's quite famous, must be for a reason. I'd like to see it again just for Glenn Ford now. I also save movies for myself for later. And TV show eps. I've still got almost 50 eps of my fave TV show left unwatched, some of them reportedly amazingly good... and I've been a fan of it since I was 14. People keep going all agog when I admit all the eps, and the only thing I can say when they ask me why not is that I'm saving them for later. I own 2 Bobby Darin movies I haven't watched yet, and several John Wayne movies, and I suspect that as I chow my way through Alan Ladd's filmography, I'll reach a point where I'll tuck a few away "to save for later." I'm so glad to know I'm not the only one who does this! Hi Kate! I love your blog anyway, but attending the TCM Film Fest with you has been SO special and FUN! Thanks for sharing it with us. Thanks also for sharing your photos with us. That still of Monica Vitti is the MOST. The one of Jean Gabin is wonderful too! I adore him. 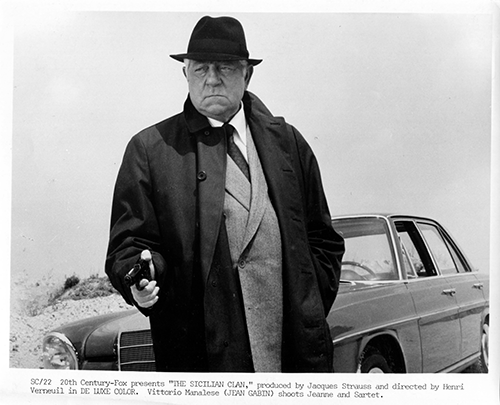 I don't thnk I've seen the Sicilian Clan but Touchez pas au grisbi is one of my favorite crime films. And I'm so glad it's not just me! I always struggle because ideally I want to be a completest and have some authority when I'm talking about a movie/tv show/person I love, but when it comes at the expense of ever being able to experience the work fresh for the first time, I just can't bring myself to do it! @Gabriella - Thank you so much! That made my day!! :) And I hadn't heard of Touchez pas au grisbi before but.. Jeanne Moreau, Lino Ventura AND Jean Gabin? I'm sold! Hi, I love your blog too - it is so me, with all the stuff of Monica, Alain, Dirk etc. I have taken the liberty of copying your great Monica still, I hope you do not mind. You will find plenty of other stills of them on my own blog: www.osullivant0.blogspot.co.uk. including a great autographed still of Bogarde which I just had to buy - its a pose from MODESTY BLAISE, you will see it on the right hand side, I have my own personalised autograph from Dirk though which he signed for me in 1970 when he was promoting DEATH IN VENICE here in London and I got to speak to him briefly. Do we know anything concrete about Monica these days? She is supposed to be in seclusion with Alzheimers ... but I imagine she is being well looked after. Great to see Sophia and Gina still going strong too and of course Anna Karina, whom I saw and reviewed last week in LAUGHTER IN THE DARK.